The weather this week is incredible. I keep making excuses to get outside and away from my desk. The warm weather really allows me to wear bright colored lips (more lipstick love here and here) and playful prints. This Topshop dress by Kate Moss is one of my favorites and Alexa Chung (worn here) inspired me to wear it with leopard print. To make it less casual I added a blazer and colorful heels. This is something I would wear to a lunch meeting and then I would throw on my trusty flats (hidden in my handbag) to shop and stroll around town. that dress is so cute with the blazer! I'm obsessed with that pretty floral dress! And it's so pretty layered with that blazer. love the shoes! wish the weather was like that here, it's been all rain recently.. Can't wait to wear summer dresses! I LOVE this outfit! that dress is adorable and looks great with that cool/casual blazer. love it! SO cute taylor!! You look amazing! You diet and hard work SURE pays off. And I love this look. I too am loving this weather! Omg I'm dying over your sunglasses!! Amazing!! They look tres chic on you! I ADORE those shoes!! seriously, the color and shape ... simply amazing!! Beautiful. I love those colors on you. Fantastic outfit. I can't wait until the weather breaks here on the east coast so that I can pull out my little dresses. love this dress! to be honest, you wore it much better than Alexa Chung :) and flats hidden in the bag is a MUST for strolling & shopping after lunch. Love the print mix! the lippie is great, too! I love that dress! And yes, I too hide a pair of flats in my purse, you never know when you will need them. What a playful and lovely combination of prints and colors! The shoes and bag a la Alexa Chung add some really nice touches. That dress looks fantastic on you and it's such a perfect springtime look! Can't wait for the weather to warm up here! The dress is really gorgeous. The print on it really suits you. love prints and bright lipstick! this inspires me to be more daring with my wardrobe...i own waaaay to much solid black. Crazy for the shoes, and I so love the bright lippie. It's awesome on you. Love your hair cut too! This is super cute and perfect for spring! Love the bag! You look so so pretty and I absolutely love how you mixed prints with the bag and dress. Gorgeous as usual!! I really enjoy the dress with the blazer and a fun print bag!! Plus the color of your shoes are great. Very cute! I love the sunglasses. I love this post! I'm usually too scared to mix prints, but i might try it! I like everything about this outfit, especially the shoes! I love this outfit- and I adore that you added that leopard print bag. Makes me happy that leopard print is going strong in Spring. This outfit is perfection! So jellie that you got a Kate Moss Topshop dress- they sell out so fast! Aren't you in love with Zara blazers? They fit so well and have the best fabric/tailoring. The shape and print of that dress is so fresh...it feels like a breath of spring! I have a denim blazer similar to that one, and I loved layering it over dresses. Hmmm, I haven't thought about that blazer in a while; add it to my list of things to which I'm looking forward to seeing when I'm reunited with my closet in a few months! Taylor! As cute as a button as always. Where in la are you? I'm in orange county. Alexa is such great inspiration. The leopard looks fantastic with this dress! I love this setting/venue that these shots were taken at. This is a great Spring outfit! Love the floral with the casual blazer. This outfit is perfect for the gorgeous Bay Area weather we've been having! (Let's hope it stays that way.) PS love the shades! I have this dress too, it's so perfect for spring. LOVE your adorbs spring dress and cute purse! Yeah. I'm loving this outfit. Great dress, blazer and bag. I'm in love with your hair color. I need this brunette winter doo gone! That dress is SUPER cute - love the pattern! I like your lipstick too...what shade/brand is it??! Your dress is so pretty and i'm in love with your shoes! love love love! So cute, you look beautiful as always! I love your dress and bag! You look adorable with this outfit! The Botkier bag is so pretty! your blog is amazing! I love your style! following now! 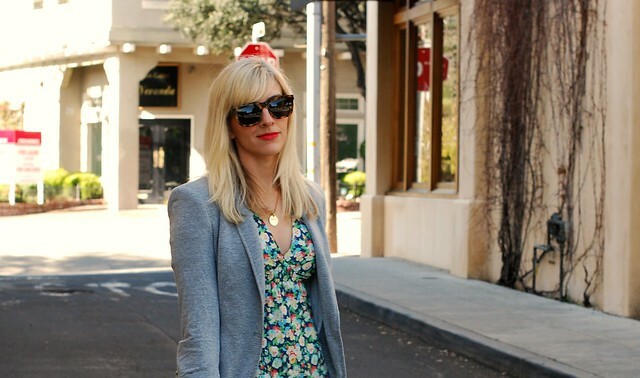 I love the playful look of florals paired with the sophisticated look of a blazer. Very classy! Nothing beats a great printed dress for Spring...love it with the blazer! You look fabulous! it's so funny Taylor, since seeing your post, I have seen at least 2 ladies wearing it around London, what a coincidence!! I love this outfit!! The blazer compliments the pattern perfectly! !